The best approach is via the village of Monastiraki. 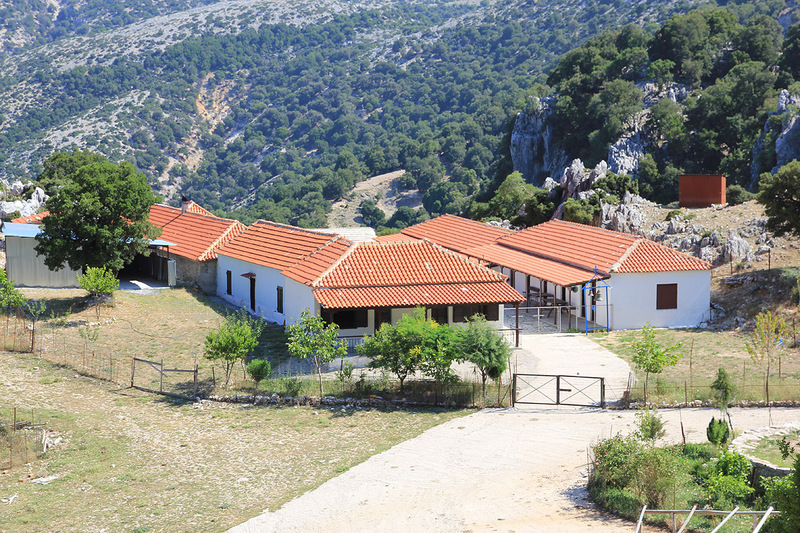 You reach this village from the north going through Vonitsa or from the south going about 11.5 km north from the village of Paleros. 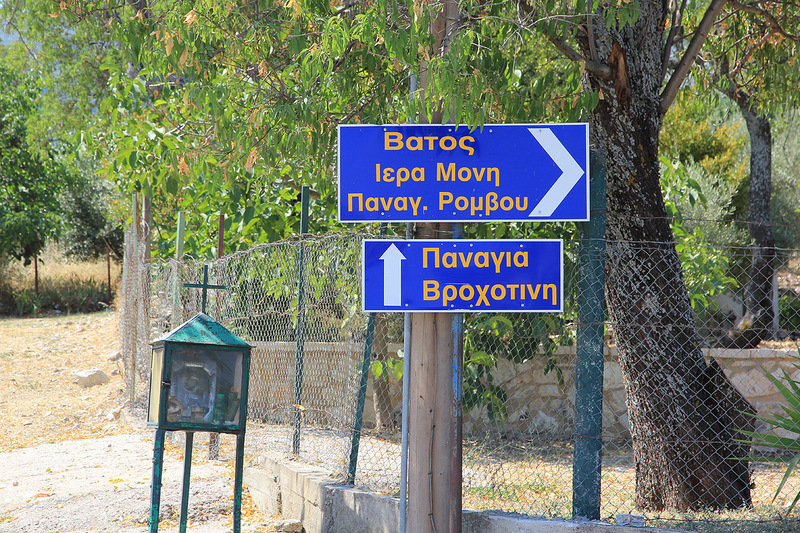 There is a sign saying Monastiraki 6km. Measure from this point. 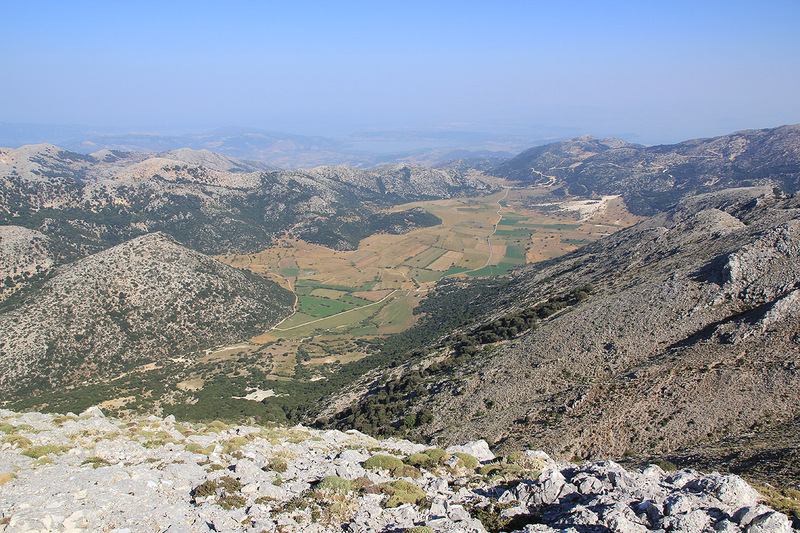 Drive to Monastiraki, stay on the main road as it turns left and climbs the hill towards the village. After 5.3 km, keep right, and stay right again at kilometer 5.6. You are in the village and you should again go right at kilometer 5.8. You should now see a football field on your left side. Near the upper right corner of this field, turn right again at kilometer 6.0. There is a sign here, do not proceed further without locating this sign. Contine along this narrow, but paved road as it enters a pretty isolated valley. You will see the road that climbs left on the mountain slope across the valley. 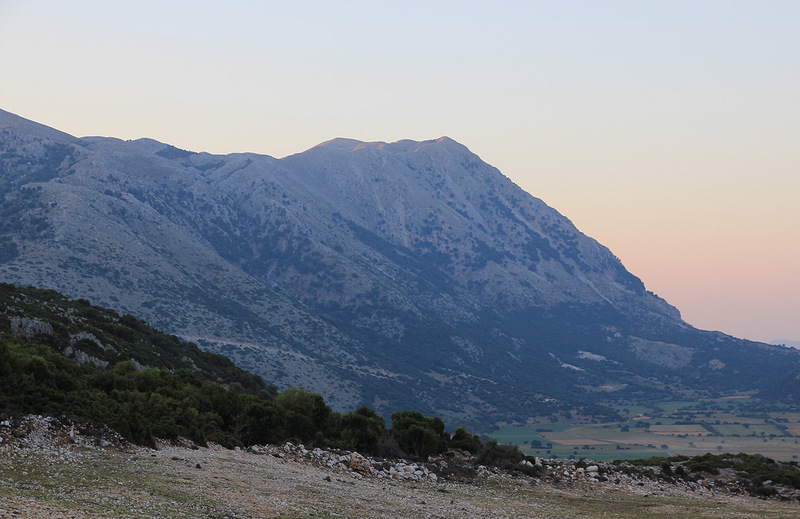 At kilometer 16.4, you turn left onto the road that serves a monastry high up on the mountain. Drive uphill to kilometer 17.9, a sharp right curve. There is space for parking at the outside of this curve. Park here if you want to make this climb with a 600 meter vertical gain. This location is N38:47.195, E020:58.769, elevation 978 meter. From the sharp curve (if you park there in order to adhere to a 600 meter vertical on foot), proceed up the road to the monastry and continue along the same road making three more curves where you arrive at a large area (trailhead if you drive as high as you can). From here, when facing uphill, hike along an old road (not suitable for driving), that starts out to your left, heading gently uphill. Follow this path until it ends. A trail takes off more uphill at this point. This trail is hard to follow, but there are several possible paths uphill, many small tracks made by animals, mostly sheep. As you get higher, traverse upwards by going left. By staying below the more rocky section above you, you will arrive at a nice break in the rocks where the trail again is more visible. 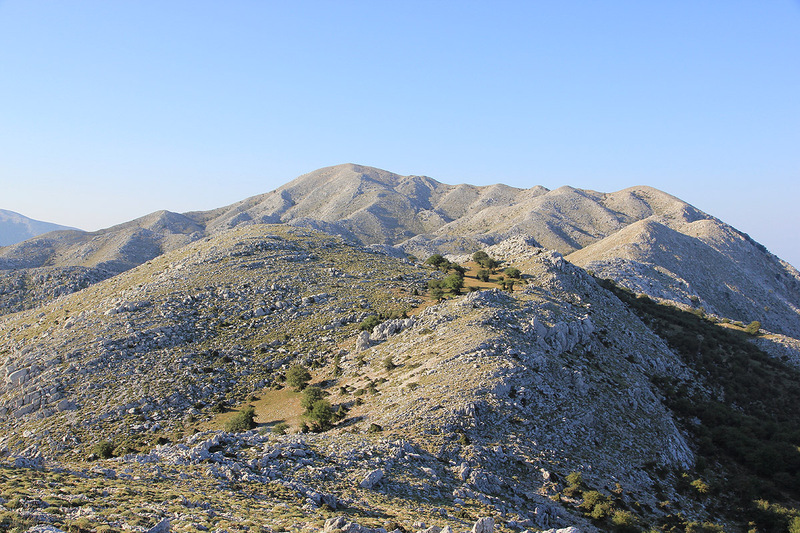 Head uphill here and arrive at location N38:46.679, E020:59.176, elevation 1392 m. Do not climb higher, but traverse to location N38:46.395, E020:59.415, where you will see a trail that heads slightly downhill. 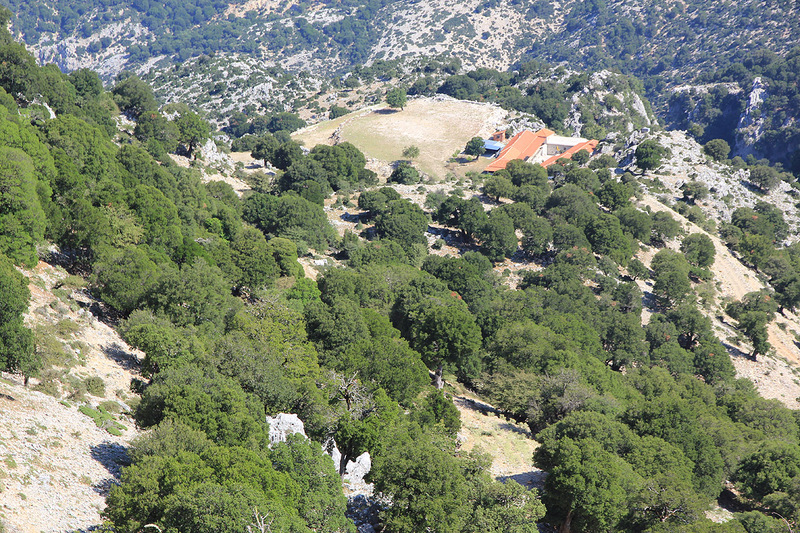 This trail traverses through the trees that you will see between your location and the beginning of the ridge that will lead to the summit of Psili Korifi. That is, staying more or less at the same elevation follow this trail across to where the ridge begins. The route now follows the ridge to the summit. There are quite a few small humps along this ridge and some of them may be avoided by contouring a bit right or left, these choices are pretty obvious, but overall the best route is more or less along the top of the ridge. We stayed two nights in the charming village of Paleros, at Sunsail Clubs, just next to the village beach. It turned out to be a place with about 200 tourists from the UK. The advantage was free use of windsurfers as well as a good selection of sailing boats. I relaxed out at sea in a Pico Laser, quite a nice little boat. 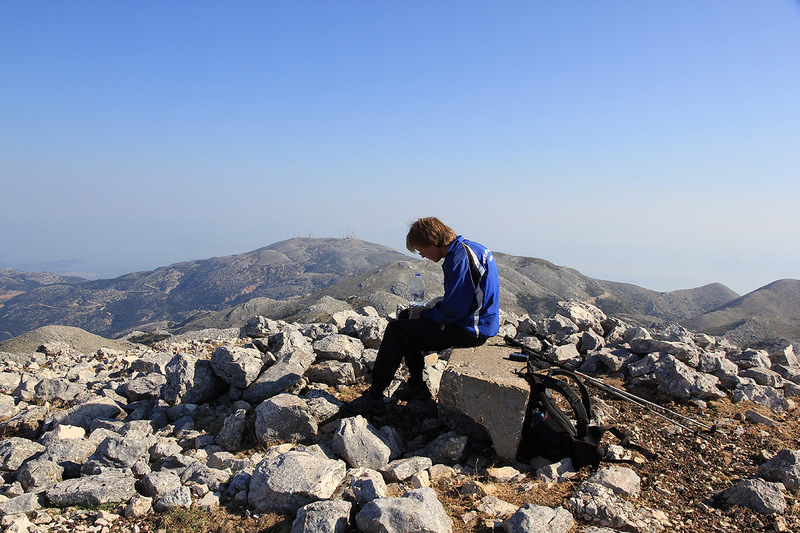 We left around 0600, but did not find the right road in Monastiraki. 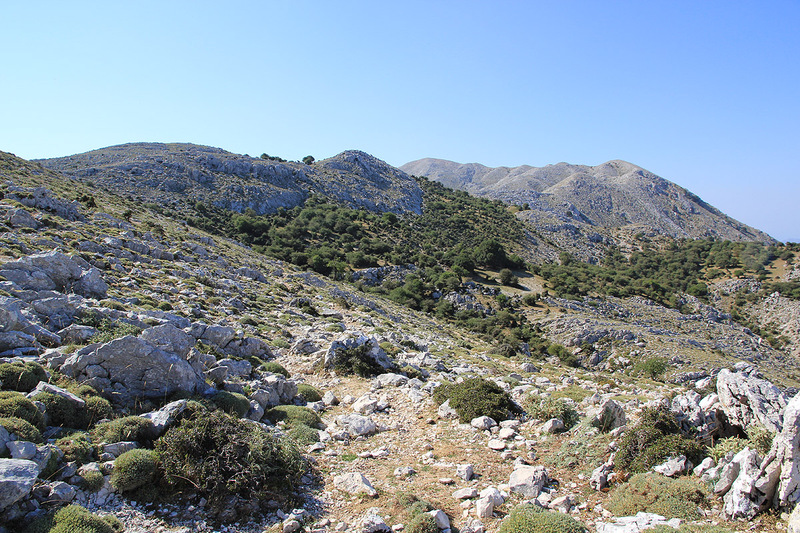 This resulted in a pretty wild traverse of the mountain between Monastiraki and the valley at the base of Psili Korifi. After quite a bit of slow driving, we finally merged back onto the road that we did not find. 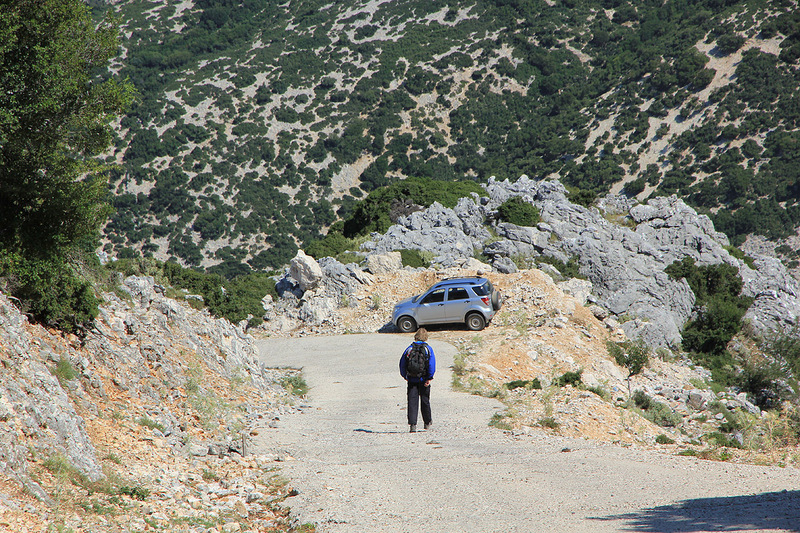 We parked in the last big curve below the monastry in order to adhere to my 600 meter of vertical gain on foot rule. Leaving the car at 0705, we walked across the first hill and descended a bit on the other side in order to climb the broad center ridge of Psili Korifi. 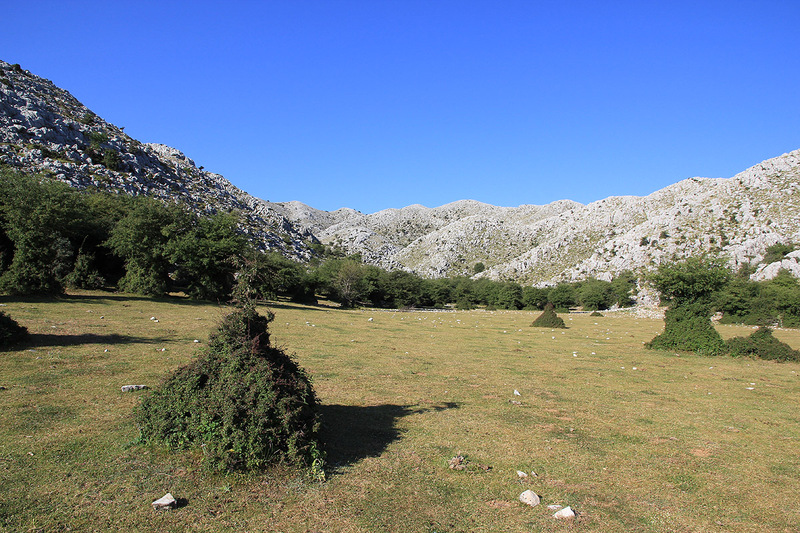 Interesting landscape, very rocky, but with numerous flat green spots scattered around. We reached the summit by 0900, the sun was already quite hot. Pretty nice views, we could see a small village on the coast and a few islands. 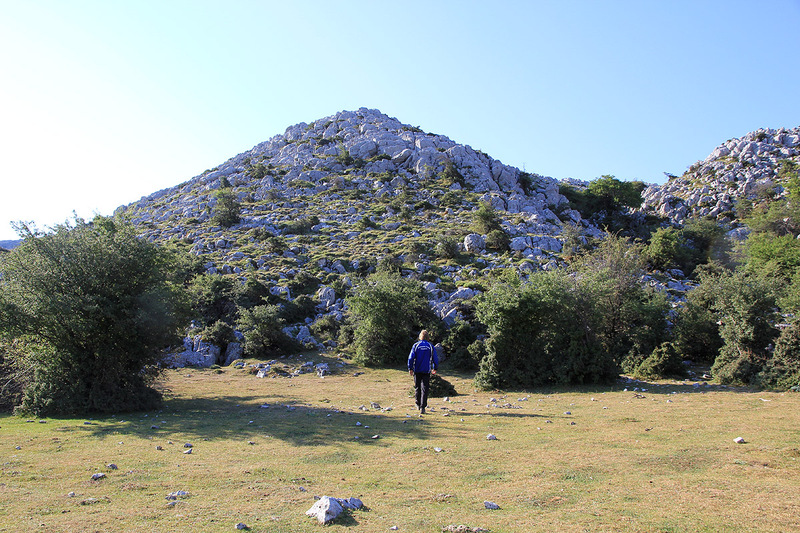 To the south, another peak that is just a few meter lower. To the north, a peak that has a small forest of antennas. We left at 0930 and decided to descend along the ridge further west. This was a nice route and we discovered a good connection traversing back to the point from where a final descent to the monastry could begin. We were back by the car at 1100. 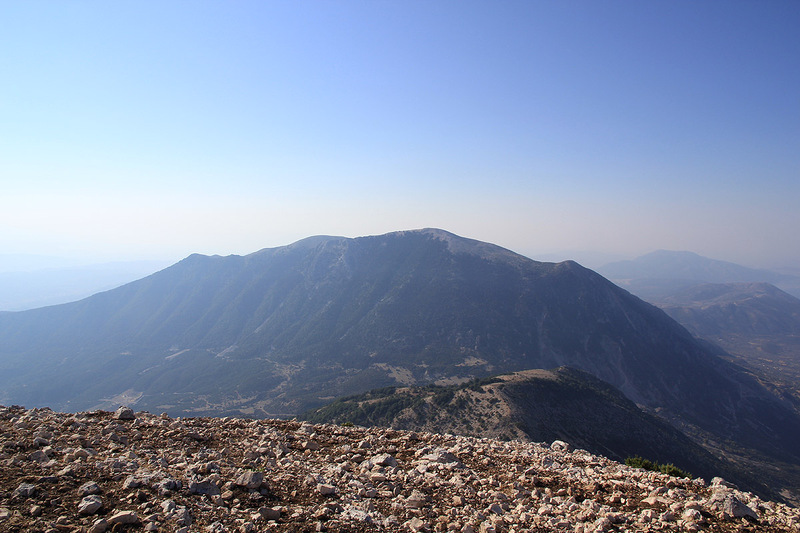 After a good stay in Paleros, where we also had time for sailing and wind surfing, we now headed south to visit the highest peak in Central Greece. 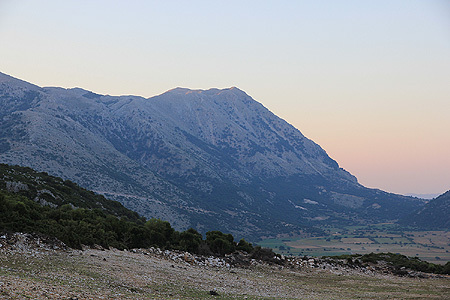 Psili Korifi, as seen from the local valley. 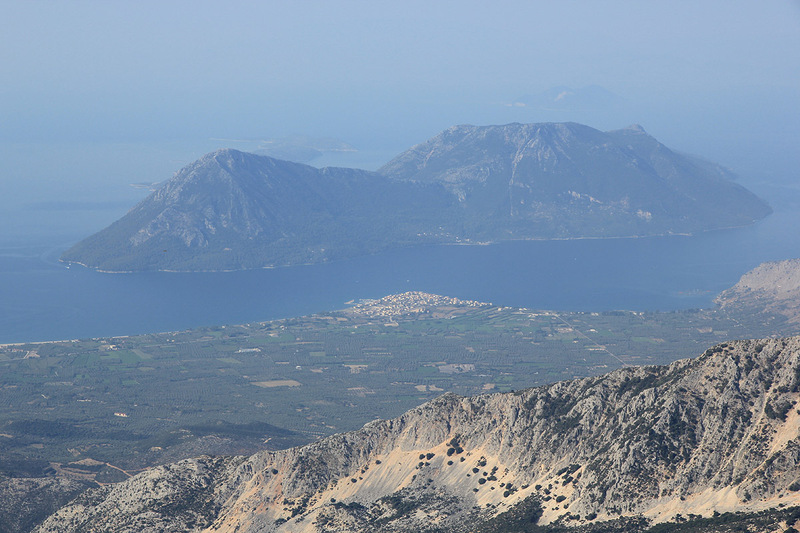 Psili Korifi, as seen from the hike. The valley, as seen from the mountain.